Booking Mama: Another Downton Abbey Addict! 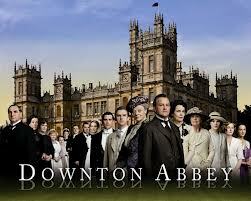 I realize that I'm a little late to the game, but I recently started watching Downton Abbey. I am hooked! I mean seriously hooked! I can't stop thinking about the characters and their interactions; and every night, I'm pushing the kids to go to bed early so my husband and I can catch up on the prior seasons. I should have listened to all of you awhile ago, but better late than never, right? As part of my new fascination with anything and everything related to this show, I am requesting some help from you. I know I've seen some blog posts, articles, etc. that mention books for fans of Downton Abbey but I didn't pay attention to them because I wasn't familiar with the show. Now that I'm finally "in the know," I'm dying to discover some books that are similar. I bought the DVD Season 1 and 2 of Downton Abbey at Costco and watched them over the Holidays. All my family is hooked. Even my kids! I've never watched this but my sister loves it. Check this site out. They did a contest for 4 books that are related to Downton. If the link doesn't work, it was Monday's contest this week. The two I've read have been the YA Cinders and Sapphires by Leila Rasheed (love!) and the adult Summerset Abbey by TJ Brown (not a fan). I also think The American Heiress by Daisy Goodwin might show somewhat how Cora's early life was although I haven't read it so I'm just going by the plot description. I am late to the party as well. I watched Season 1 and 2 in the 10 days before Season 3 started. I love the show too -- Mr. BFR and I discuss the characters and make predictions. I'm late to game as well. I started watching when I had the flu and couldn't do much else! I'm addicted now!